Rachel is eight and a half months pregnant, and still allowed Josh to take off for the day with us. Thank you Rachel. Josh and Rachel live just moments away from the Gulfport shore disaster area. 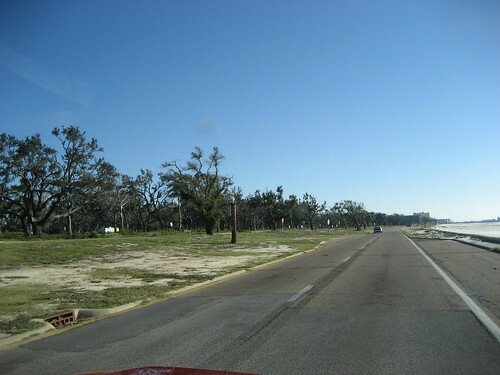 The Gulfport area of Mississippi was hit hard last year from hurricane Katrina, real hard. The waterfront area is absolutely devastated. Josh took us in the morning to tour the disaster area. Once the waterfront was a bustling area with casinos, shops, beautiful houses filled with residents and tourists. Now all that remains is concrete foundation slabs where the houses once stood, clusters of FEMA trailers where the residents now live and cracked, split and shattered roads, trees and buildings. It’s chilling to stand in these areas and imagine the power of the storm that caused the devastation. However, the area is being reborn. Houses are being rebuilt, casinos are being restored and the residents are courageously returning. People like Josh and Rachel are movin' in. 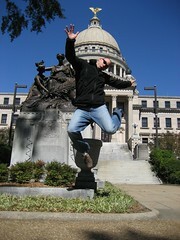 After touring the Mississippi shoreline Josh took us north to our 18th capital, Jackson, Mississippi. 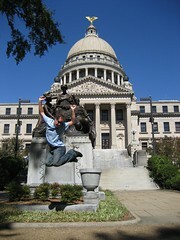 We made a quick stop at the capitol building and got some good jump shots with Josh. I am from Mississippi - now living in Philadelphia. The pictures you showed brought tears to the eyes - but the words you wrote --- grand! Thanks for taking the time to see the Coast of Mississippi and for sharing that there is hope andthat people are coming home. I may do the same. Good luck Guys --- this is a great idea. I'm about to get off work and go home to sing in the bath tub.